I had to pop into town and obviously went to Superdrug and Boots for a few bits and bobs. 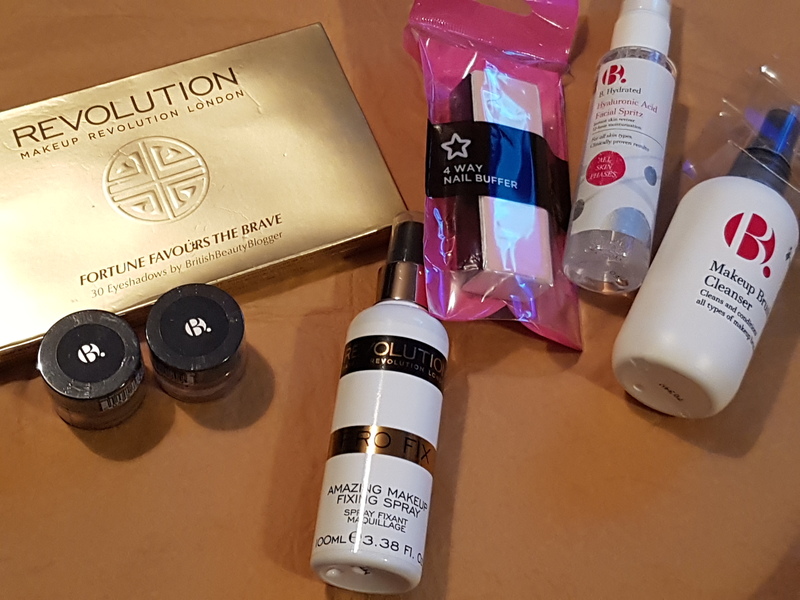 Make Up Revolution Fortune Favours the Brave designed by British Beauty Blogger. This palette is my favourite and my original got dropped and broke so this is a replacement. B. Individual eyeshadow pots – these were 49p each as they’re being removed from stock so hello bargain. Make Up Revolution Amazing Make Up Fixing Spray – another restock item. I use this to fix my make up in the mornings. Personally I find this lightweight spray works great but like most things it depends on your skin/make up. It also lasts for ages. Superdrug 4 way nail buffer – this is the best nail buffer around. I picked up 2 but one is already in use. Plus total bargain. B. Hydrated Hyaluronic Acid Facial Spritz – I haven’t used this before but I keep reading that this is really good for skin and because mine is so sensitive I thought a spray would be the best way as it won’t mean too much acid on my skin. B. Make Up Brush Cleanser – this contains a disinfectant and really gets my brushes clean. It’s my favourite cleaner and super easy to use. Restocking as my current bottle was struggling a little this weekend. This was a total Soap & Glory shop – I think I might have a problem. Happy Glamper gift set – this has a lot of goodies and a shower proof jacket – which I unfolded and will now never be able to fold up again. There’s also face wipes, dry shampoo, folding hairbrush, lip gloss, eyeliner, hand sanitizer, body spray – all of which are just as useful in London as they would be camping or at a festival. Hand Food hand cream – a pump bottle makes this a lot easier to use, no trying to put a lid back on with freshly moisturised hands. Clean, Girls Body Wash – for that lovely soft clean feeling as I get out of the shower. So there you go, my little beauty shop. Any favourites in my basket?